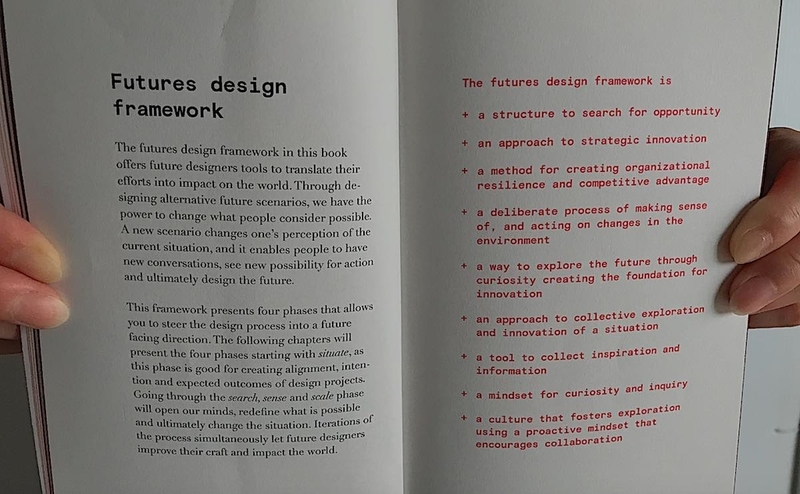 The futures design framework in this book offers future designers tools to translate their efforts into impact on the world. Through designing alternative future scenarios, we have the power to change what people consider possible. A new scenario changes one’s perception of the current situation, and it enables people to have new conversations, see new possibility for action and ultimately the future. This framework presents four phases that allows you to steer the design process into a future facing direction. 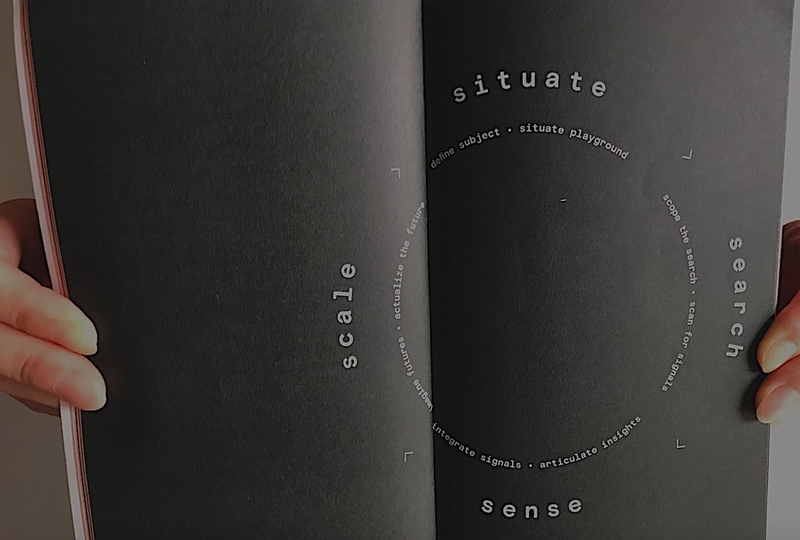 The following chapters will presents four phases starting with situate, as this phase is good for creating alignment, intention and expected outcomes of design projects. Going through the search, senseand scale phase will open our minds, redefine what is possible and ultimately change the situation. Iterations of the process simultaneously let future designers improve their craft and impact the world. Define the subject of study and the playground of your project. In order to explore future horizons we must first understand the current situation we are in, the point from where we are looking forward. Understand the here and now, the space from where we explore and understand the initial questions and hypotheses that are driving our project. Define the subject that we wish to explore and align our team around, and the practicalities and frames that guide the project. Explore, unravel and harvest relevant and inspiring signals of change. When everything is uncertain, anything is possible. In the search phase, we look for signals that show glimpses of what futures might emerge. New technologies, behaviors, emerging cultures and sociopolitical forces of today, signal what is possible in the future. The search phase invites us to look for these signals in their emerging state, and capture the potential that may reside within them. Integrate signals, look for patterns and articulate insights. Making sense of the collections of signals is the foundation for designing new futures. Sensing is the creation and interpretation of a map of all our collected data. Connecting signals with each other and integrating them with our previous understanding of the situation reveals new connections and enable us in uncovering a new sense of awareness. What emerges are insights that illuminates and articulates the unspoken future potential of our situation. Imagine, share and actualize new scenarios for the future. Bring the future to life by entering an imaginative space where cognition meets the physical world in a creative manner. The scale phase invites us to use our insights from the previous phases as a foundation to imagine, share and actualize new scenarios for the future. This is the time to design actions, conversations and experiences that engage others in exploring inspiring visions, radical ideas, provoking thoughts and new possible scenarios. Speculation and imagination is the first step in actualizing the future.